I think I have a very healthy diet, eating a variety of meats, fishes, fresh vegetables, fruits, nuts and seeds. Despite this, I’m not sure that I get all the vitamins, minerals and nutrients I need. This is something that I have foundto be difficult to calculate. So to be completely sure I am getting enough, I do take a few supplements every day. I don’t go crazy, and only take 2 (now 3) supplements every day. This includes a men’s vitamin supplement and a krill oil supplement. I use to take regular fish oil for added omega 3’s, but in doing some research I learned that the best omega 3 supplement was actually krill oil. I have also added a new supplement to my regimen: Sea Buckthorn Oil. Last year, after 5 years of wearing reading glasses (and losing probably 100 pairs) I decided to get contact lenses. I wear them for 30 days and then replace them with a new pair. Since starting to wear contacts, I found myself waking up in the morning with really dry eyes, and I was barely able to see. Sometimes my eyes were so dry, the contacts would pop out of my eye at night and I would find them stuck to my cheek or eyelashes. I kept a bottle of eye drops next to my bed. Once I put the drops in I was fine. Im not sure if this is due solely to the contacts because I also found that my mouth and nose were relly dry when I woke up. Recently I came across a post about Sea Buckthorn Oil and some research that said that it was found to be helpful with dry eye problems. I had never heard of Sea Buckthorn Oil so I did some more research and decided to try it. After taking it for a few days my issue with dry eyes and mouth was noticeably better. Why am I telling you this? Well, during the course of researching this supplement I found that not only had it been found to help with dry eyes, but it was also a nutritional powerhouse and a perfectly primal supplement. Legend has it that in ancient Greece, when sick horses were let loose to roam and die naturally, the Grecians were surprised to find the horses were stronger and more energetic. This was traced to a plant the horses were grazing on called Hippophae Rhamnoides L, meaning trees that make horse shine. This plant or shrub is now simply referred to as Sea Buckthorn. Sea Buckthorn has a rich history of use in treating numerous medical conditions. It has been called a wonder plant in many Asian countries, including China, India, and Pakistan. The berries have been used for more than 1,000 years in Tibetan and Indian systems of medicine. In traditional Chinese medicine, it has been used to aid digestion and treat cough, circulatory disorders, and pain. The small, yellow-orange to red berry of the Sea Buckthorn plant is an abundant source of vitamins, amino acids, fatty acids and 27 trace elements. Sea Buckthorn oil contains 106 known nutrients and bioactive substances, including vitamins A, C, and E, polyphenols, carotenoids, flavonoids, essential fatty acids and trace elements including zinc, selenium, manganese and iron. Many of these constituents help build, restore and improve immune function. The juice, oil and berries of the Sea Buckthorn plant have been touted to provide many benefits to natural health. 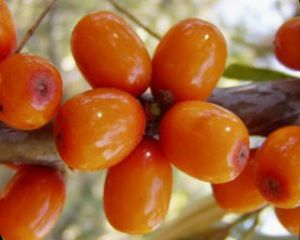 The combined action of nutrients in sea Buckthorn oil provides integrative anti-cancer properties, according to a description on the Drugs.com website. It blocks the carcinogenic effects of certain substances and prevents the growth of cancer cells. The antioxidants in the oil prevent free-radical damage and cancer-cell formation. The seed oil increases antibodies and strengthens the body’s resistance to cancerous mutations. Sea Buckthorn oil also contains numerous anti-inflammatory and anti-ulcer substances, providing benefits for gastrointestinal health. Laboratory studies confirm the efficacy of the seed oil for the treatment of gastric ulcers. The oil also provides a protective coating inside the stomach and intestines, preventing the damaging effects of pathogens. Cardiovascular disease is closely related to free-radical damage of the arteries and high blood fat. Sea Buckthorn oil minimizes the effects of free radicals and reduces blood fat levels. It is a rich source of fatty acids that are conducive to heart health, especially oleic and linoleic acids. Both are known to reduce cholesterol, regulate blood pressure and inhibit blood platelet aggregation. Sea Bckthorn oil is also widely used to treat various skin conditions, including burns, eczema, psoriasis, dermatitis, sunburn, wounds, frostbite, radiation treatment and cosmetic laser surgery. The oil contains a high content of nutrients essential for metabolism and regeneration of skin cells. Thus it is also effective to help minimize wrinkles and other symptoms of aging skin. Sea Buckthorn contains carotenoids, tocopherols, sterols, flavonoids, lipids, ascorbic acid, and tannins. Tocopherols and tocotrienols in the fruit or seeds of sea buckthorn, collectively known as vitamin E, have antioxidant activity. α-Tocopherol has the highest antioxidant activity and is the most abundant tocopherol, comprising approximately 76% to 89% of the berry. In traditional Chinese medicine, it has been used to aid digestion and to treat cough, circulatory disorders, and pain. Because of their hemostatic and anti-inflammatory effects, the fruits are added to prescriptions in Indian and Tibetan medicine to treat pulmonary, GI, cardiac (eg, ischemic heart disease), blood, hepatic, and metabolic disorders. The flowers are used as a skin softener in Tajikistan. In Mongolia, extracts from the leaves and branches of the plant are used medicinally to treat colitis and enterocolitis in humans and animals. In Middle Asia, the leaves are used to treat GI and skin disorders, and topically applied to treat rheumatoid arthritis. In Russia, the oil from the seeds and fruits is used topically to treat chronic dermatoses, eczema, psoriasis, lupus erythematosus, burns, frostbite, and cervical erosion. Oil from the fruit has been used to treat thrombosis. Oil extracts have been used in ophthalmology to treat keratitis, trachoma, conjunctivitis, and injuries or burns of the eyelid. Well, the list goes on and on. I have not found any side effects of the supplement, but the research indicates that it should not be taken by pregnant women as its effects have not been studied. Sea Buckthorn has now become one of my daily supplements. Is it right for you?